pathophysiological aspect and in the development of new therapeutic strategies. While deciphering the mechanisms of vascular smooth-muscle proliferation in PH, we previously suggested that many analogies existed between PH and cancer. Consequently we hypothesized that major pathophysiological pathways linked to the process of cell senescence (including telomere maintenance and telomerase activity) were involved in the process of cell proliferation in PH. In addition, we questioned whether the process of lung cell senescence was involved in the pathogenesis of degenerative lung diseases such as chronic obstructive pulmonary disease (COPD). At the time of the creation of the team in January 2009, we therefore focused our research on the role of cellular senescence in lung vessel and tissue remodeling in PH and chronic lung diseases. The team was restructured at this time to develop new methodological approaches, to acquire new skills and to establish new collaborations in this emerging area of research. This strategy was successful since: – we provided strong arguments in favour of premature cell senescence in the pathogenesis of COPD and in pulmonary vascular disorders; – we explored new therapeutic strategies targeting cell senescence with the goal of counteracting smooth muscle cell proliferation in PH or to delay the onset of cell senescence in COPD. These has led to the publication of seminal papers in the field, to the application of four patents and to the development of a translational research linking lung-cell studies and cohorts of patients with chronic lung disease for whom we paid attention to obtain a detailed aging phenotype. We have therefore pioneered the concept that COPD is associated with a global process of accelerated ageing in the lung as well as in systemic organs. Expanding the hypothesis that common processes such as cell senescence are crucial to the pathogenesis and progression of age-related cardiovascular and lung diseases has led to successfully apply in 2013 to the creation of a University-Hospital Department (DHU) on a broader research program encompassing age-related lung and cardiovascular diseases. This original emerging area of research, together with the creation of the DHU, have strengthened collaborative studies with other teams at our research centre and has increased the attractiveness of our team since two senior researchers in cardiology, T Damy in 2010 and G Derumeaux in 2013 (co-coordinator of the DHU), have decided to join the team in order to extend the concept of cell senescence to cardiac disorders. Our research program is therefore moving along two main avenues: (a) investigation of hypertrophic lung-vessel remodeling in pulmonary hypertension (PH), with the goal of developing new therapeutic strategies; and (b) investigation of the process of cellular senescence in the pathogenesis of chronic lung and cardiovascular diseases. This program builds on knowledge of the mechanisms linking cell senescence and cancer to be applied in the respiratory and cardiovascular systems. Indeed, both lung and cardiovascular disorders may present a degenerative or a proliferative component. These two main fields of research are interactive and complementary, and common methodological approaches are being developed at the mechanistic and therapeutic levels. The overall ambition of our 2015-2020 team program is to develop an integrated and multidisciplinary research, to amplify translational and basic research programs with special focus on senescence process in chronic lung and cardiac diseases. 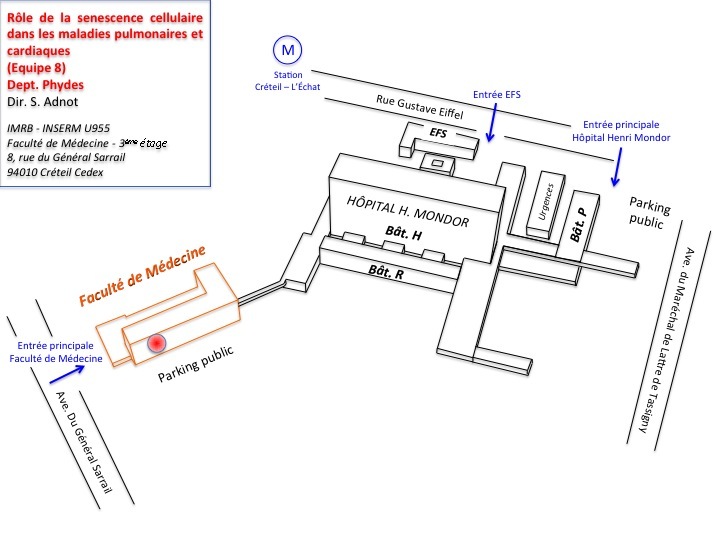 Boyer L, Audureau E, Margarit L, Marcos E, Bizard E, Damy T, Le Corvoisier P, Derumeaux G, Drouot X, Covali-Noroc A, Boczkowski J, Bastuji-Garin S, Adnot S. Telomere Shortening in Middle-Aged Men with Sleep-Disordered Breathing. Annals of Am Thor Soc. 2016;13(7):1136-43. Mouraret N, Houssaini A, Abid S, Quarck R, Marcos E, Parpaleix A, Gary-Bobo G, Dubois-Rande JL, Derumeaux G, Boczkowski J, Delcroix M, Blasco MA, Lipskaia L, Amsellem V and Adnot S. Role for telomerase in pulmonary hypertension. Adnot S, Amsellem V, Boyer L, Marcos E, Saker M, Houssaini A, Kebe K, Dagouassat M, Lipskaia L, Boczkowski J. Telomere Dysfunction and Cell Senescence in Chronic Lung Diseases: Therapeutic Potential. Amsellem V, Lipskaia L, Abid S, Poupel L, Houssaini A, Quarck R, Marcos E, Mouraret N, Parpaleix A, Bobe R, Gary-Bobo G, Saker M, Dubois-Rande JL, Gladwin MT, Norris KA, Delcroix M, Combadiere C and Adnot S. CCR5 as a treatment target in pulmonary arterial hypertension. Mouraret N, Marcos E, Abid S, Gary-Bobo G, Saker M, Houssaini A, Dubois-Rande JL, Boyer L, Boczkowski J, Derumeaux G, Amsellem V, Adnot S. Activation of lung p53 by Nutlin-3a prevents and reverses experimental pulmonary hypertension. Dagouassat M, Gagliolo JM, Chrusciel S, Bourin MC, Duprez C, Caramelle P, Boyer L, Hue S, Stern JB, Validire P, Longrois D, Norel X, Dubois-Rande JL, Le Gouvello S, Adnot S, Boczkowski J. The cyclooxygenase-2- prostaglandin E2 pathway maintains senescence of chronic obstructive pulmonary disease fibroblasts. Am J Respir Crit Care Med. 2013;187703-714. Amsellem V, Gary-Bobo G, Marcos E, Maitre B, Chaar V, Validire P, Stern JB, Noureddine H, Sapin E, Rideau D, Hue S, Le Corvoisier P, Le Gouvello S, Dubois-Rande JL, Boczkowski J, Adnot S. Telomere dysfunction causes sustained inflammation in chronic obstructive pulmonary disease. Noureddine H, Gary-Bobo G, Alifano M, Marcos E, Saker M, Vienney N, Amsellem V, Maitre B, Chaouat A, Chouaid C, Dubois-Rande JL, Damotte D, Adnot S. Pulmonary artery smooth muscle cell senescence is a pathogenic mechanism for pulmonary hypertension in chronic lung disease. Gary-Bobo G, Houssaini A, Amsellem V, Rideau D, Pacaud P, Perrin A, Bregeon J, Marcos E, Dubois-Rande JL, Sitbon O, Savale L, Adnot S. Effects of HIV protease inhibitors on progression of monocrotaline- and hypoxia-induced pulmonary hypertension in rats. Savale L, Chaouat A, Bastuji-Garin S, Marcos E, Boyer L, Maitre B, Sarni M, Housset B, Weitzenblum E, Matrat M, Le Corvoisier P, Rideau D, Boczkowski J, Dubois-Rande JL, Chouaid C, Adnot S. Shortened telomeres in circulating leukocytes of patients with chronic obstructive pulmonary disease. Am J Respir Crit Care Med. 2009;179(7):566-571. 15 novembre 2018 L’exercice physique bénéfique dans le traitement de la drépanocytose, une étude coordonnée par Pablo Bartolucci de l’équipe 2!